I study our Galaxy and other nearby galaxies. I use large spectroscopic surveys to do chemical cartography on the Milky Way and also study how big, spiral, Milky Way-type galaxies form through analyzing integral field spectroscopy data. I love to teach and do outreach, whether it be to kindergartners or college students. I believe the best kind of education is through mentorship and so I try to mentor and connect with students as much as I could! I dream of an astronomy community unhindered by the lack of resources. My ultimate goal is to have a lot of Filipino astronomers working on world-class research all over the globe. I am a proud Filipino and an Astronomy PhD student at the University of Texas at Austin. I’m a galaxy gal! I study our own Galaxy and how it formed using the chemical abundances of a lot of stars. They serve as fingerprints through which we can do Galactic Archeaology and get a detailed picture of the formation and evolution of the Milky Way. I also study galaxies farther out! I decompose the spatially-resolved light of a galaxy into its different stellar populations. From this we can get a star formation history to explain how the different parts of galaxies evolve, chemically and age-wise. 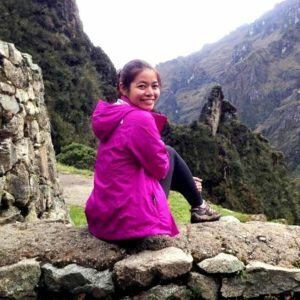 My dream is to extend my science and the astronomy community to my home country by providing research and post-grad opportunities for astronomy in the Philippines. When I’m not busy adding to our understanding of the universe, you’ll find me singing, playing the guitar, squashing, and dreaming of traveling the world.